Through Pre-Registration, courses are ranked in order of preference. Students are allowed to select and rank (1=most desired, 10=least) up to ten courses. During tenth week, students are “resolved” into classes. Students are automatically enrolled into certain sequenced courses; usually general education and language courses that continue to meet at the same time. Depending on the quarter, students may drop out of certain auto-enrolled courses before selecting and ranking other courses. Pre-Registration is available 24 hours a day, between 9:00 AM on Monday of eighth week and 5:00 PM on Friday of eighth week. During this period, students may update courses and rankings as often as they choose. The date, time of day, and order in which students log into the system are irreleveant to the outcome. Resolution is the process by which students are registered for their courses. The resolution system runs an algorithm that works by course, not by student. For each individual course, it looks at the student’s class year and course ranking. Priority is based on year of study in the college, fourth through first, in most courses. For General Education courses, priority is given to second and first years. Though the resolution algorithm attempts to maximize students’ choices, there is NO GUARANTEE of enrollment in any requested course. Default algorithm – Looks at a student’s class year and course ranking. Priority is given to fourth year students, followed by third, second, and then first year students. Within each class year, requests are ordered by course ranking. Core algorithm – Looks at a student’s class year and course ranking. Priority is given to second year students, followed by first, third, and then fourth year students. Within each class year, requests are ordered by course ranking. This algorithm is most commonly used for general education courses. The Pre-Registration Resolution process takes several hours to complete. You will know the process is done, and your classes for the upcoming quarter are confirmed, when you see a message in my.UChicago. Why did I not get my top ranked courses? The resolution algorithm attempts to maximize students’ choices; however, a student cannot be put in a course if: the course is already full, the student already has a course that meets at the same time, or the student is already registered for 4 courses. Must I participate in Pre-Registration? Students are strongly encouraged to participate in this process. Students who anticipate 4 auto-enrolled courses and who do not wish to change sections should log-in to confirm that their anticipated courses are in the system. Students who wish to enroll in any new courses for the next quarter are more likely to get enrolled in the classes they want if they participate. Additionally, this process is used by the Collegiate divisions to assess demand for classes. If resources are available, new sections or additional seats may be added based on the demand shown through this process. What if I have logged in but do not have time to finish my course rankings? Pre-Registration is available 24 hours a day, between 9:00 AM on Monday of 8th week and 5:00 PM on Friday of 8th week. Students may experience slower system response time during busy periods, especially late afternoon on Friday, so it is very important to plan ahead. The system will run all requests in the system at 5:00 PM on Friday through the resolution process. Any changes after 5:00 PM on Friday must wait until the add/drop period opens on Monday of finals week. Who should I contact with questions before, during, or after I access Pre-Registration? Students should contact their adviser with general questions about course selection. If a student believes a course should be listed, but it is not, then contact the department responsible for the course offering. Refer back to the Pre-Registration page for step-by-step guides. Technical issues should be directed to courseadmin@lists.uchicago.edu. Why am I unable to select laboratory or other required course components? The course resolution process will automatically assign related course components (labs and discussions). In order to maximize the number of ranked choices that a student receives, the system assigns all ranked courses first and then assigns related course components that best fit the student’s schedule. Students may change course components online during the Add/Drop period if the desired section is open, or with consent if the section is closed. Will I be registered in courses that require consent of the instructor? Pre-Registration allows students to select and rank consent courses to help offering departments assess demand for classes. Even though a student may request and rank consent courses during this period, the student will not be registered for these courses until consent is obtained. Students may obtain consent from the instructor beginning the Wednesday after the quarter ends using a Consent Form available on the Add/Drop site. If the instructor uses a paper consent form, return the signed form to the Registrar’s Office, Press Building, 1427 E. 60th Street, for processing after the quarter begins. NOTE: Consent forms for Autumn quarter courses will not be available until the Wednesday after the Summer quarter ends. Will I be registered in courses that have prerequisites? Pre-Registration allows students to select and rank courses with prerequisites to help offering departments assess demand for classes. Even though a student may request and rank courses that have prerequisites during this period, registration will not occur for these courses unless there is space available in the class and the student meets the prerequisite requirements. Where can I find course capacity or enrollment figures for a particular course? The total seats allocated to each section, and the total number of students enrolled, are shown in the details page of each course. Cross-listed courses may have seats reserved for both College and Graduate students. Once the reserved seat limit for College students has been reached, consent is required. What if I get into a section of a course that causes a schedule conflict? Students may select and rank courses that meet at the same time; however, the resolution process will not enroll a student in courses with conflicting meeting times. If students are interested in a course that has more than one section offered, they may select and rank each different section. However, the resolution process will place the student into no more than one section of the coure. When and how will I know the outcome of my Pre-Registration requests? The student’s class schedule will be available for viewing on my.UChicago by Monday of Finals Week. All the courses ranked on the Pre-Registration tab will be available beginning Monday of Finals Week. Students can see the results in the My Pre-Registration tab within the description box. The result is underneath the day and time of the class. If I decide I don't want theses courses, when can I change my registration? Students can change their course registration during the Add/Drop period beginning Monday of Finals week. What if I can't find a course in Pre-Registration? There are certain types of courses that are not included in Pre-Registration, which are listed below. However, if you feel there is a course missing that should be included, please email courseadmin@lists.uchicago.edu. Graduate Level Courses (30000 and above) are not included in the College Pre-Registration process. These courses should be added via the Consent Form at the beginning of the quarter. The form is available on the Add/Drop site beginning the Wednesday after the end of the quarter. NOTE: Consent forms for Autumn quarter courses will not be available until the Wednesday after the Summer quarter ends. Late course additions by departments cannot be accommodated in Pre-Registration. These courses will be available during Add/Drop (starting Monday of finals week). Why can't I access Pre-Registration? Students who are graduating in the current quarter or who will be studying abroad the next quarter are not eligible to participate in the Pre-Registration process. In addition, students with holds will not be able to access the Pre-Registration system. To view the status of a hold and the office that has placed the restriction, log into my.UChicago and click on the My Alerts portlet in the Home tab. What are common error messages shown for registration? Not Enrolled, Class XXXXX Full. Combined section class XXXXX is full. Enrollment did not take place. Class Number XXXXX not in Active Status. Cannot Enroll. Time Scheduling Conflict for class XXXXX and XXXXX, not enrolled. 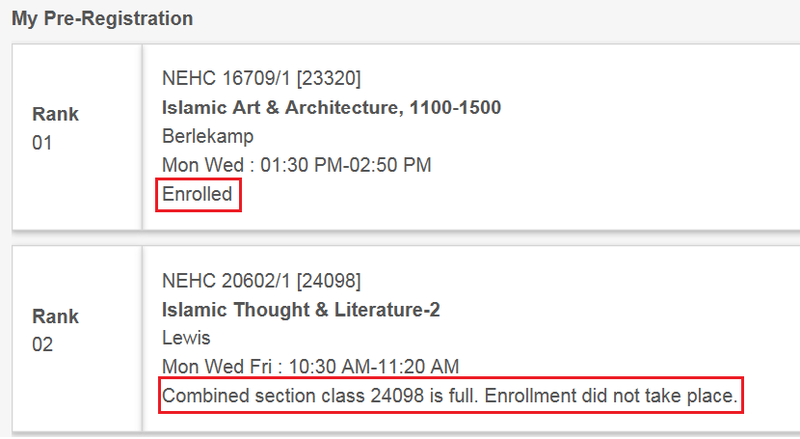 Multiple Enrollment not allowed for course, Add not processed. Instructor Consent Required to Enroll in Class, Add not processed.